When was the last time your fire alarm had maintenance? When investing in a fire alarm system for your business, it is important for you to make sure they are properly maintained all year long. With proper care, your fire alarms can last for up to two decades before they need to be replaced. Let’s take a look at everything you need to know about the basics of fire alarm maintenance. Your fire alarm may have different maintenance needs depending on its age. A new alarm will need to be maintained a lot less than an older one. If your fire alarm is five to 10 years old, environmental factors can cause the components of the alarm to break down. Keep an eye on the fluctuations of humidity, voltage, and temperature that could lead to alarm failures. For models that are 10 to 15 years old, maintenance will be needed constantly in order for the to work well. The older your systems are, the more extensive the maintenance will need to be. Make sure you keep track of what your system will be and how much maintenance it will need. One of the best ways to keep an eye on your fire alarm is to manually test them every year. Testing your fire alarm will ensure they are working properly and constantly protecting your business. Although most standards are that you test your fire alarm annually, look at the manufacturer’s maintenance guidelines as well as your local agencies to ensure they do not require more frequent testing. All fire alarms are different. Some fire alarms may have a certain button to push in order to test them while others may require a different procedure to test them. Whatever the case may be, it is important for you, as a business owner, to know how to properly maintain your fire protection equipment. Read your fire alarm’s manual to learn about its sensors, testing procedure, signs of failures, and requirements of re-installation in order to properly maintain your fire alarm. Fire alarms are an important part of your business’s fire protection systems. Are yours properly maintained? 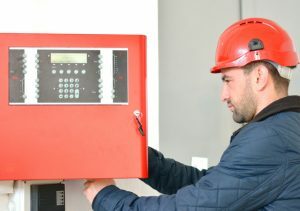 For more information on fire alarm maintenance or to have yours inspected, call Anderson Fire Protection, Inc. today! Fire Alarm Maintenance with Anderson Fire Protection Inc. This entry was posted on Friday, November 11th, 2016 at 5:23 pm. Both comments and pings are currently closed.